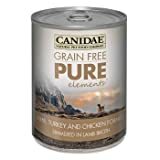 Store Home » Canidae Dog Food » Canidae Turkey Dog Food » Canidae Grain Free Pure Elements Lamb, Turkey & Chicken Canned Dog Food, Case of 12, 13 oz. 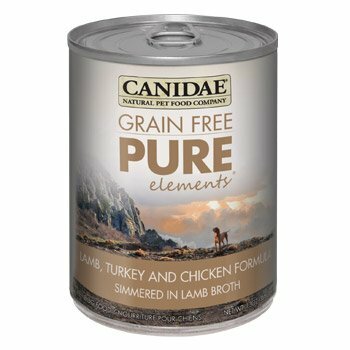 Canidae Grain Free Pure Elements Lamb, Turkey & Chicken Canned Dog Food, Case of 12, 13 oz. 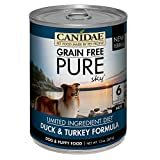 Canidae Grain Free Pure Canned Dog FoodWe've formulated this grain free, protein-packed recipe for adult dogs of all breeds. With its high quality meats, delicious flavor, and simple natural ingredients, it's great for every dog in your family and for dogs who may have developed food sensitivities. With only 8 key ingredients including whole foods, this simple recipe does not contain fillers, grains, dairy, or eggs. 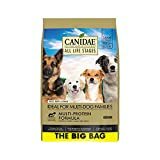 CANIDAE All Life Stages recipes are vet formulated for dogs of all ages, breeds, and sizes. That makes mealtimes for multiple dog households much simpler than dealing with multiple bags of different foods. Single dog households will also enjoy the beneﬁts of one bag for all dogs—no more guessing or switching based on your dog’s age, breed, or size. Formulated speciﬁcally for all life stages with premium ingredients and optimum protein for nutritionally dense formulas—never corn, wheat, or soy. CANIDAE Grain Free PURE wet foods offer quality nutrition without compromising great taste. We use meat or ﬁsh as the ﬁrst ingredient for quality protein and limited ingredients for gentle digestion—making them ideal for sensitive pets. Available in a variety of delicious ﬂavors, enticing textures, and convenient serving sizes. Each recipe provides your pet with delicious nutrition you can feel good about feeding.